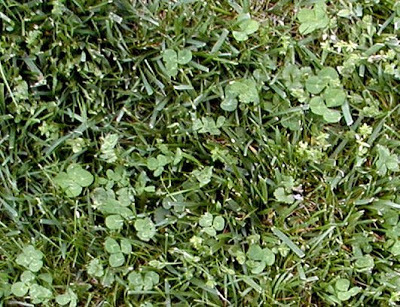 How many four-leaf clovers can you find in this picture? Two lovely guests of ours, Jean and LaRue, found some four- and five-leaf clovers at the Inn when they were visiting last weekend. That sent Dave on a mission to see how many of those clovers he could find. While Brigette rarely sees four-leaf clovers after poring over the ground for an hour, Dave is the type of person who looks at the ground and in 5 seconds, says, matter-of-factly, “There’s a four-leaf clover,” so it didn’t take him long to find not one, not two, but 11 four-leaf clovers and 2 five-leaf clovers on a patch of grass that was about two square feet. We often say how lucky we are, getting to live in such a pretty and peaceful place and being able to share it with others. We love being able to share our lucky clovers as well. 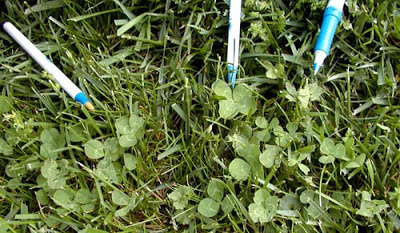 If you’re coming to stay with us for a relaxing few days to get away from the hustle and bustle of city life, you might consider clover hunting on your itinerary list. Other activities to enjoy include sitting on the deck feeding the two Asian Mandarin ducks who have taken up residence at the Inn, listening to Buford the Bullfrog (yes, he’s back for the season and his smooth bass voice is more entertaining than ever), watching the many bird species that live around the Inn inside Pisgah National Forest and listening to the Whip-poor-wills in the evening (they sound beautiful! ), making an appointment for a massage with one of our talented massage therapists (advance notice, please) or just taking that really long nap that you’ve been waiting weeks to get. Have a relaxing weekend, everyone.